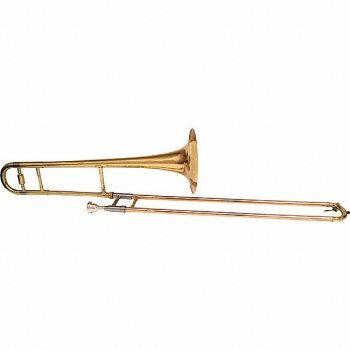 Blessing B128 Student Trombone (USA). Scholastic (student) trombone outfit. Standard equipped with .500" bore, 12C mouthpiece, 8" bell, and clear epoxy lacquered finish. Case is formed plastic with aluminum valance (C-128). Made in the U.S.A. Includes Blessing Factory Warranty that covers defects in workmanship and materials for a period of (1) one year from date of purchase. Woodwinds Northwest is an authorized BLESSING Dealer!